Non-human cells can be insufficient for modeling human mechanisms because of species differences. Several issues with primary human cells or immortalized cell lines have led to the exploration of stem cells as a new platform for disease modelling. Stem cells are a renewable resource and contain the patient’s genetic information, allowing us to model diseases with a specific genetic background in the context of disease susceptibility. The core advantage of stem cells is their derivation from a specific background, which permits studies of genotype and phenotype linkage. Human-induced pluripotent stem cell-derived neurons are promising in vitro model systems that display both the functionality and behavior of mature neurons. They are also available in large enough quantities for screening workflows. 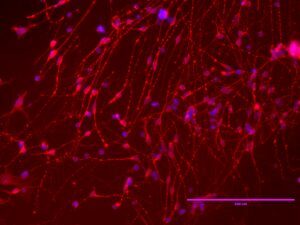 Large-scale production of hiPSC-derived neurons is applied to neurotoxicity screening and for studying disease and function. We take advantage of iPSC-derived neurons as a cell model, and high-content imaging as a technique that provides phenotypic readouts. This enables us to conduct multi-parametric assays to optimize stratification of candidate compounds and to reduce the translational gap for in vivo relevance. IRBM has a license agreement with iPS Academia Japan for the use of Induced pluripotent stem cells (iPSCs) derived from healthy individuals, and from patients affected by Huntington disease (HD). iPSCs with different CAG repeat lengths will be used as a starting point for in vitro differentiation into human brain cells for the discovery of novel targets and treatments and to understand the mechanisms that may contribute to HD pathology.